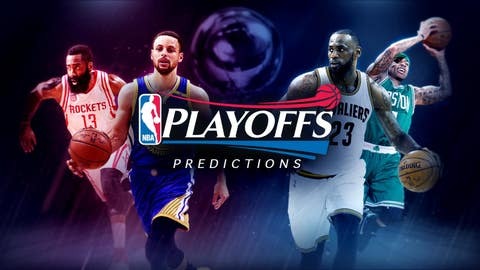 WhatIfSports.com simulated the 2017 NBA playoffs 1,001 times to predict which team will be crowned champions this June. The simulation generated every team's round-by-round odds to advance. See which squad is favored to capture the Larry O'Brien Trophy. When the calendar flipped to March, the Celtics were four games behind the Cavaliers in the race for the East’s top seed. Since then, the Cavs dropped 14 of 24 games — including the last four of the season — to surrender the top spot to Boston. The advantageous seed may not be all it’s cracked up to be, though. Boston was 2-2 against its first-round opponent, the Chicago Bulls, but went 3-0 against the No. 7 seed Pacers. 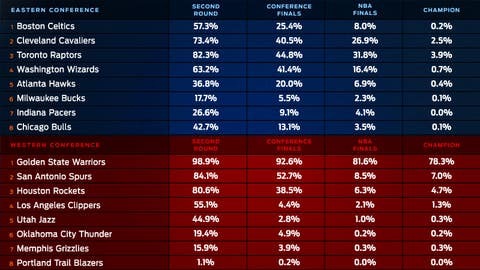 The Celtics struggled against the Bulls in WhatIfSports.com’s playoff simulation, winning just 57.3 percent of the time. The lackluster showing carried through to future rounds as well, with Boston advancing to the Eastern Conference Finals 25.4 percent of the time and the NBA Finals 8.0 percent of the time. The Celtics won the title in only 0.2 percent of simulations. Washington’s 49 wins are the franchise’s most since a 54-28 season in 1978-79. Scott Brooks replaced Randy Wittman on the bench this year and will try to lead the Wizards out of the first round for the third time in four seasons. 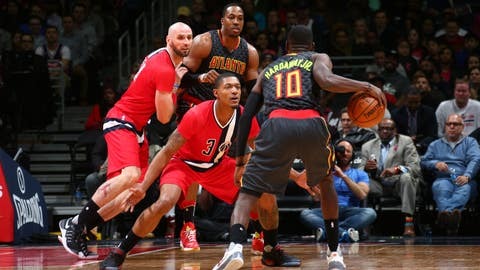 Opposing the Wizards are the Atlanta Hawks, playoff-bound for the 10th straight season. They’ve advanced past the second round only once during that stretch, though. It’s no big surprise that our simulation engine likes the Wizards over the Hawks in Round 1, but Washington getting the better of Boston in the second round will raise some eyebrows. We have the Wizards advancing to the Eastern Conference Finals 41.4 percent of the time, compared to just 25.4 percent for the Celtics. The Raptors won 12 of their last 14 games and are one of four teams to finish the season with four straight victories or more, joined by the Pacers and Clippers. 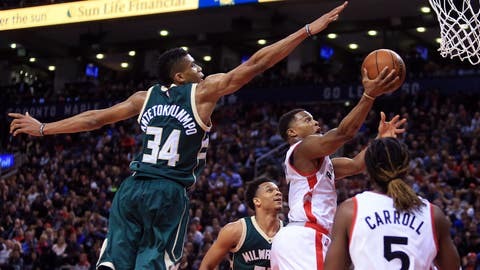 Their defensive game plan against Milwaukee will center on slowing down Giannis Antetokounmpo. The Greek Freak leads the Bucks in points, rebounds, assists, steals and blocks. The Raptors will build on last year’s run to the Eastern Conference Finals, if our simulation engine’s prediction holds true. Toronto reached the NBA Finals in 31.8 percent of simulations, the most of any Eastern Conference team. The Raptors’ 3.9 percent championship odds rank fourth, trailing three Western Conference teams. The Pacers were three games under .500 before winning the final five games of the season to finish 42-40. Their reward for the late-season hustle is a date with the defending champion Cavaliers. LeBron James and Co. were on autopilot for portions of the season, but they’ve shown the ability to elevate their play in the postseason. 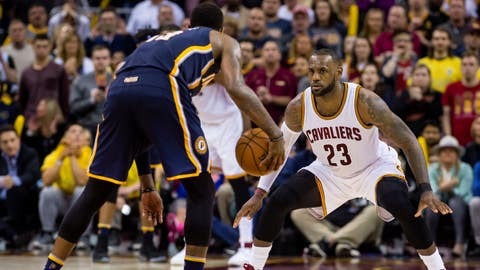 Our simulation engine likes the Cavs’ chances against the Pacers but predicts a surprising struggle in Round 2. 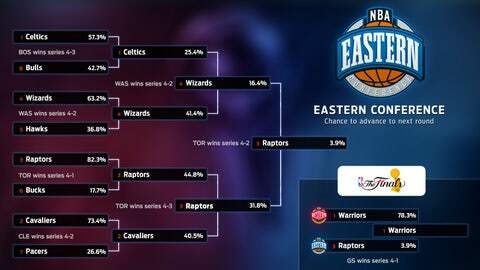 The Raptors got the better of the Cavaliers in the simulations, edging Cleveland in likelihood to reach the conference finals and NBA Finals, as well as title odds. Golden State’s quest for a third straight Western Conference title begins with a best-of-seven series against Portland. 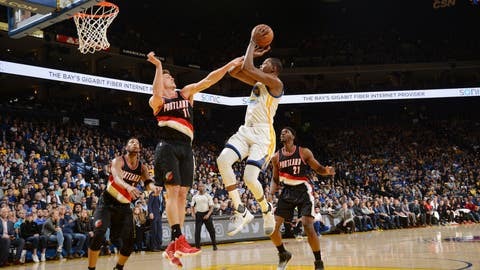 The Warriors are 4-0 this season against the Blazers, and Kevin Durant has averaged 32.3 points in three appearances. The Blazers should provide Durant a platform on which to round into shape after an injury sidelined the star forward for 19 games. Could Portland pull off a shocking upset? Don’t hold your breath. According to our NBA simulation engine, the Warriors will cruise past the Blazers, advancing to the second round in 98.9 percent of playoff simulations. Golden State is the overwhelming title favorite in 2017, capturing the title 78.3 percent of the time. The Clippers-Jazz series will feature two of the game’s best shot blockers. 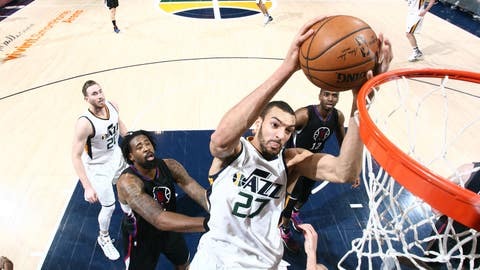 Jazz center Rudy Gobert leads the NBA with 2.64 blocks per game and is largely responsible for Utah’s league-best 96.8 points allowed. The Clippers’ DeAndre Jordan averages 1.65 rejections a game, good enough for seventh-best in the league. With the paint clogged, look for outside shooting to be at a premium, where the Clippers have a small advantage. WhatIfSports.com’s NBA simulation engine envisions a chalk-filled first round, with the better-seeded team advancing in every series. However, the Jazz come the closest to pulling off the upset, beating the Clippers in 44.9 percent of simulations. L.A. rarely advanced past the second round in the simulations, when its likely opponent would be the Warriors. But the Clippers do have the sixth-best title odds at 1.3 percent. It’s safe to say James Harden’s switch from shooting guard to point guard was a resounding success. 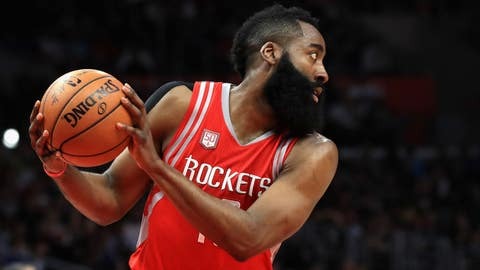 He averaged career highs in points (29.1), assists (11.2) and rebounds (8.1) this season and led the Rockets to a third-place finish in the tough Western Conference. Speaking of stat-stuffers, Houston’s first-round opponent is Oklahoma City and Russell Westbrook, whose triple-double exploits are well-documented. Harden’s Rockets are the pick to advance. Houston defeated Oklahoma City in 80.6 percent of simulations. With 4.7 percent title odds, Houston is the third most likely team to win the championship. Tim Duncan is gone, but it’s the same old Spurs. 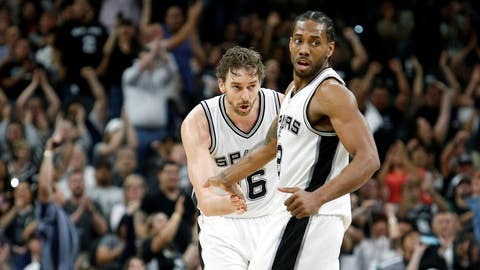 San Antonio crossed the 60-win threshold for the third time in four seasons as Kawhi Leonard improved from Defensive Player of the Year to a legitimate MVP candidate. The Grizzlies are a familiar playoff foe, with San Antonio and Memphis meeting in a 2-vs.-7 clash just last year (a 4-0 Spurs sweep). The Spurs won’t overlook the Grizzlies, though, as a few players and coaches are sure to remember the 2011 playoffs, when No. 8 Memphis toppled the No. 1-seed Spurs. Look for San Antonio to move on this year, with our simulation engine giving the Spurs an 84.1 percent chance to advance to the second round. The Spurs reached the Western Conference Finals in 52.7 percent of simulations, but advanced to the NBA Finals only 8.5 percent of the time. However, they made the most of those opportunities, winning the title 7.0 percent of the time. Every team's round-by-round odds to advance, including NBA championship odds for each team.